A treat for the ears and eyes. Photo courtesy of Licorice Pie. MELBOURNE – I just got back from DJing five parties in two weeks in Australia with Eamon Harkin, my Mister Saturday Night partner. We were in Sydney, Melbourne, and Perth, and had a lot of time between parties to explore, scout record stores and shops, eat, and, in Melbourne, watch a lot of tennis. (The Australian Open was on, and Eamon's a big fan.) This is what I discovered in Melbourne off the courts and out of the DJ booth. An amazing record store. Was most surprised to find a larger section of pre- and post-War blues than I've seen in pretty much any store, even in the United States. I found great Library of Congress records and a mint copy of Howlin' Wolf's Evil. "Smokestack Lightning!" Their collection of disco, soul, funk, '70s synth music, Krautrock, and jazz was also notable. There's a room in the back where all the deals are that I didn't even get into. 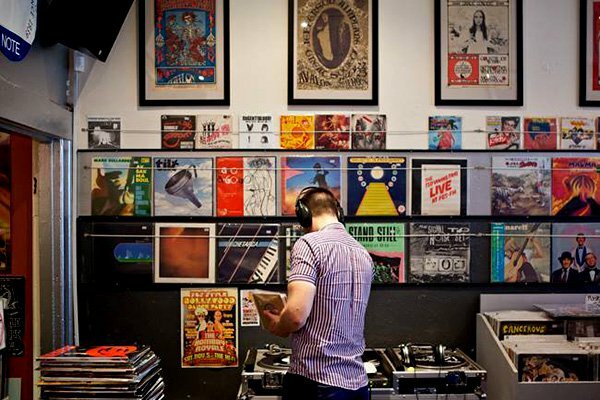 This store is a must for any lover of music and collector of vinyl. Very good coffee and, conveniently, very close to Licorice Pie. They make a specialty Chai blend called Mad as a Hatter. A flea-like market in Fitzroy. Check the Anna Devine skirts, shirts, and dresses. Beautiful stuff made from Western African fabrics! There was also a really cool baby clothes-maker there. Very good records in Fitzroy. I think Plug Seven is a roving shop that pops up for a month or two here or there, so check the link. I found some great disco twelves that would've been snapped up in a second in New York or London. Also, a very good selection of rare reggae, funk, and soul. Good tunes and good late-night food. Northcote and Fitzroy neighborhoods were really nice to wander around. The Block Arcade and Hosier Lane's "Graffiti Museum." The Block Arcade is mega-touristy. There were a couple cute shops along the way, but nothing that was particularly unique. The cool thing about Hosier Lane is that people are allowed to graffiti there. The bummer about that is that it's just a bunch of kids putting up really bad tags. I found better street art in the back alleys of Fitzroy. Chin Chin and Cumulus Inc and probably most of the restaurants on Flinders Lane. Chin Chin serves Southeast Asian food in a large, bustling, neon-accented space. It was solid, but it costs too much considering there is so much other good Southeast Asian food around. Cumulus has good oysters, and the ingredients they use are generally good, but they're trying too hard. My take-home after going to these spots is that Flinders Lane is like the Meatpacking District of Melbourne, if the MPD had no stupid clubs in it. Heide Museum is a modern Australian museum surrounded by an amazing sculpture garden. I think you've gotta have a car to get there. It's 30 minutes outside town. Super Bowl and I Love Pho are supposed to be the dope pho spots. Australian Centre for Contemporary Art. The name pretty much says it all.